When my daughter called last night she told me I was putting too much food on the blog. She's right, but I just can't get out of that rut. Can't get myself to the sewing room to start (or finish) any projects, can't even step foot into the rose garden to snap some blooms. Right now life is about just getting by. Getting the proper meals cooked, getting the dude fed, cleaning up. Keeping up with the house, delivering every thing he needs, keeping on top of multiple medications and multiple blood pressure readings each day. Going to therapy, going to work for a few minutes while he's at therapy, getting work done from home. The merry-go-round just keeps going. But it's better than when he was in the hospital. At least my home base is my actual home. So kiddo, I will work on finding some non-food pictures. But for today I have to go with this one. 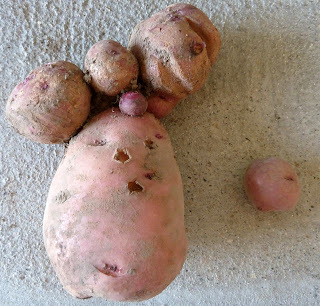 I was digging red potatoes and picking tomatoes for my mom and for folks at work (hubby can't have either so we might as well share) and came across this red tater who must have thought he had a different purpose in life. And yep, that's all one potato sitting next to the regular-sized potato.